^ Duffy, Michael (1 February 2002). "The Battle of Vittorio Veneto, 1918". FirstWorldWar.com. http://www.firstworldwar.com/battles/vittorioveneto.htm. Retrieved 2008-06-10. ^ Arnaldi, Girolamo : Italy and Its Invaders. Harvard University Press, 2005. Page 194. ^ Fritz Weber, "Das Ende der alten Armee. Österreich-Ungarns Zusammenbruch,. ^ Stato Maggiore dell'Esercito, "L'esercito italiano nella Grande Guerra", Ufficio Storico, vol. 5, Tomo 1,2, 2bis, Roma, 1988. ^ Low, Alfred D.The Anschluss Movement, 1918-1919, and the Paris Peace Conference. American Philosophical Society, 1974. Page 296. 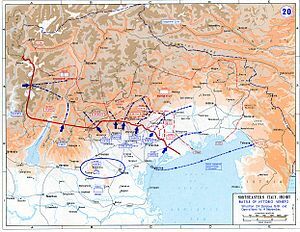 ^ "The Battle of Vittorio Veneto during October and November saw the Austro-Hungarian forces collapse in disarray. Thereafter the empire fell apart rapidly." Marshall Cavendish Corporation: History of World War I. Marshall Cavendish, 2002, pp. 715-716.